Warming of the climate system is unequivocal’- At the beginning of the 21st century, 600 scientists from the Intergovernmental Panel on Climate Change, pursed through thousands of documents from various studies and scientific journals and came to this conclusion. In this section we will discuss the most commonly seen effects of global warming on weather & Environment, earth & animals. 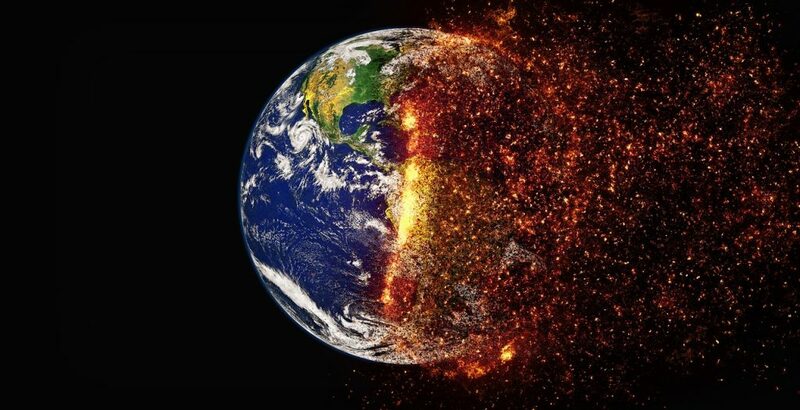 Industrialisation, Population and economic growth, increased demand for resources, dependence on fossil fuels and consumerism have all attributed to increase in greenhouse gases which trap the excess infrared radiation reflected from the earth’s surface. Increase in global temperature has its effects evident on land and water masses, in climate variations and even on living species on the Earth. Rainfall is increasing in some parts of the world. This is not a small increase but there is up to 67% increase in annual expected rain than 50 years ago. Snow fall is also affected the same way. Rome that normally experiences mild winters was covered in snow in the winter of 2018.Torrential rains are not unusual in Mumbai. But in a day in 2017, it rained 15% of the total annual rainfall, flooding the city at an alarming rate. Increased duration of spring and summer may appear beneficial for a while as there is an extended growing season for crops. On the flip side, wildfires and forest fires are also on the increase as the climate gets drier. Heat waves are also happening frequently causing heat exhaustion, heat stroke and aggravating existing medical conditions. Europe experienced record low temperatures of -20C to -27C this year.The vineyards in Rhone valley, France is affected by climate changes. Slight temperature increase is ruining the crop and the wine making process. The same is to be said of cocoa plantations in Africa and many other food crops. This will seriously disrupt food supply and drive costs upwards. The backyard food gardens will not be spared either. The intensity and frequency of hurricanes in the have been on the increase since 1970. They have higher wind speeds and carry more rain. Rise in sea levels and higher ocean temperatures have increased the occurrences of storm surges.Storm surge is an abnormal rise of the water generated by a storm and it often causes coastal flooding. Hurricane Katrina of 2005 is an example of the devastation caused by a storm surge.In the Key West, Florida area stronger Atlantic hurricanes of categories 4 and 5 are hurting the archipelago as seen in 2017. Droughts will occur when rainfall is decreased and when the duration of the dry spell is long. Other factors accumulate to cause droughts – less soil moisture, reservoir and lake levels, ground- water recharge, changes in timing of water availability or reduced access to water supply for agriculture.Australia’s drought began in 1995 and lasted until 2009. Spain imports water. Northern India’s ground water loss is visible from outer space via satellite. Vast areas of China, Syria, South eastern Brazil are drought stricken as is California in North America. South western America is a sensitive region at high risk of drought. The Greenland and The West Antarctica ice sheets are the world’s major ice caps situated at the poles. Increase in the global temperature has caused the ice to melt down faster at the rate of 125 billion tons of ice per year. This rate of melting raises the sea levels by 0.35 mm per year. There are some predictions that the Arctic Ocean will become ice free during summers.Glaciers and snow caps in every continent are melting at higher rates now, almost three times faster than they did five years ago. The glaciers in Peru, Montana, Himalayas, and Indonesia which feed important rivers and satisfy the needs of millions of people living in their vicinity are disappearing fast. It is very likely we will witness shortages of drinking water when this happens.The Alps in Europe, the famous skiing destination, is losing its ice at a rate of about 3% per year. Ice and snow from here could disappear completely by 2050 if the melting continues. Sea levels have risen up to 20cm during last century. This has been most due to the expansion of water molecules when heated up. In addition, rapid melting of ice glaciers contributes to this phenomenon to a smaller scale. Scientists have predicted that sea levels can raise form 7-23 inches by the year 2100.Venice, the beautiful city of canals in Europe is getting slowly inundated. It can become inhabitable by the end of this century. As sea levels rise, coastal erosion is a reality. Increased wave energy and in combination with powerful storms, eats away at beaches and cliffs. Most of the world metropolises, cities and towns are located at the sea coasts and is likely to be lost. Many islands in the Pacific are already disappearing with their inhabitants having to relocate to safer ground. Most plant species, small mammals and fresh water molluscs cannot naturally shift their geographical ranges fast enough to keep up with projected rates of climate change. Marine organisms will face lower oxygen levels and greater ocean acidification. Quantity and location of Zooplankton, an essential part of the food chain in the oceans will affect the existence of whales. Coral reefs, polar ecosystems, coastal and low lying areas are being affected. Loss of habitat has resulted in reduced number of polar bears, penguins and other arctic creatures.Non-native or invasive species will thrive in some places causing an impact on the biodiversity. They will compete for space, food and disrupt the balance of the ecosystem. Many terrestrial, fresh water and marine species have shifted their geographic ranges, seasonal activities, migration patterns, and reproduction cycles and species interactions in response to climate change. Only 2% of the world water is fresh water. In this 70% is snow and ice, 30% is ground water and 0.5% constitutes lakes, rivers and other surface water bodies and 0.05 % is in the atmosphere.Though there is increased rainfall, this does not translate to groundwater recharge because the water runs off into the rivers and oceans rapidly. Increased atmospheric temperatures also cause faster evaporation of surface water. Another source of fresh water is diminishing because of rapid melting and the loss of inland glaciers.Cape Town in South Africa has been suffering from drought over the past years. It is predicted that Day Zero- the day all taps run dry will happen in 2018.There is strict water rationing imposed by the government. There is a worry of ancient microorganisms, lying dormant in ice, causing disease outbreaks when the ice melts. Not all organisms can withstand the cold over a very long period of time. But bacteria propagating by spores and viruses have the capability of surviving. Also pathogens that thrive in warmer climates will be able to affect health at places that were previously cold. Climate change may also lead to more resilient or resistant organisms.The year 2007 had the first European outbreak of a tropical disease Chikungunya, which is carried by the Asian tiger mosquito. It was possible for the carrier to thrive in Europe because of the warmer climate now. A second outbreak happened in 2017. The resurgence of the Zika virus is another example. Unusually warm temperatures and shorter winter caused an outbreak of anthrax in Yamal Peninsula, Russia in 2016. The change happening in our world started almost 150 years ago at a slow rate. Studies show that the rate of change has increased over the last 50 years and is still increasing. The economic expense of combating it is also very high. But nations have taken steps to curb the causes of global warming. Reversing the clock will take time. The world’s poor, the children, elderly and weaker sections will be affected the most. It is important that everyone together plan and develop means to manage the situation well in advance.